To make my list, I said the word aloud, and if I had a good feeling about the word, it went on my list. There was a long list of things, so I narrowed it down to the ones I had the strongest feelings for. It was a meaningful exercise because it brought these things to my conscious awareness. For example, knowing that I crave light helps me to be aware of how much sunshine I get — even inside the house. If I can sit in front of a sunny window, I will. In fact, when it's time to read aloud, the kids will get my chair ready for me! Anyway, for fun, I pulled out a thesaurus so I could "dress up" my list and give it a little flair — IEW style! For life, I was going to use flora or fauna, but I couldn't decide between the two and living won out over be or being. What would you have picked? Color was a hard one too. Rainbow won out over hue because I love the colors of the rainbow, but hue was growing on me. I want to be full of His joy! Your turn: What words touch your soul? Make your list and share! 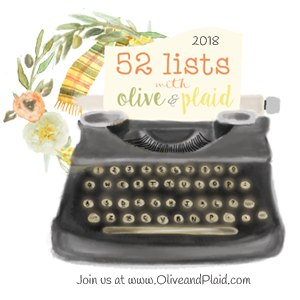 Join us at www.OliveandPlaid.com. I love that! What a great way to enhance your words. So glad you're doing the 52 lists too! Saying the word aloud - LOVE this!! Kindred - touches my heart, too. Looking forward to the next 51 list ahead and the deeper connections. May the word "endure" bring you the joy of your heart. Love the way you chose your words. I could add sunshine to my list, also. Fantastic word for 2018! Love this!!! I am a word girl, so this was a pleasure to read!!!! I love how you enhanced your words and how you took the time to say your words out loud.